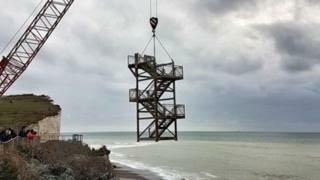 Work is under way to lift steps down to a popular beach after recent "significant" erosion made it unsafe. The steps at Birling Gap in East Sussex will have a "safer anchorage" as close to the cliff edge as possible, Wealden District Council said. "Up to four metres of cliff were lost in one day," Wealden Councillor Claire Dowling said. More than 350,000 people visit the cliffs each year but while the work is taking place, the beach is inaccessible. Depending on the weather, the council hopes it will be finished by the end of November, "before the coming winter storms".